I remember once as a child that I ate so many chocolate eggs I was violently sick!! I had lots of lovely aunts and uncles and everyone gave us children an egg…. and although we were supposed to be strictly rationed somehow we had got away with eating a whole lot in one go….. So I am looking forward to a luxury and guilt-free chocolate treat this weekend! To that end I have been experimenting – and as so often happens a failed experiment turns into a discovery! 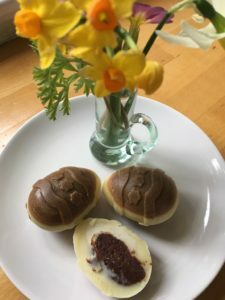 I was trying to make white chocolate eggs but I only had coconut sugar as a sweetener, which turned the mixture brown… and also resolutely refused to dissolve properly. (Maybe if I had been more patient ….?) So when I poured it into the moulds, the heavy brown sugar part went to the bottom, and the white chocolate, still sweetened by its mix with the sugar but not overly so, rose to the top! Melt 1/2 cup of cacao butter in a bowl over hot water. Stir in 25g coconut oil, then 50g coconut sugar (finely ground). Whisk until the sugar has melted and blended (or partially blended if you want stripey eggs!). Or use light agave syrup – 1 tbsp should be enough but check for sweetness to your own taste. Blend in 1 tbsp of lucuma if you have it. Once all is smooth, pour into the egg mould up to about 5mm from the top. Drop in a spoonful of the filling mixture to bring the chocolate to the top. It should float nicely in the middle. You then need to let them set. Kate Magic has a tip – put one lot in the freezer until just frozen, and the other in the fridge – you can then pop out the frozen ones and wedge them firmly onto the other set, and then put them all back in the fridge (or freezer) to set finally…. The thing about raw food is that you just need to have fun – it doesn’t have to be perfect, but if you keep checking the taste along the way you can make sure its delicious!